Parking lot lighting pole kits with light pole height choices from 10' to 39'. We carry square steel light poles as well as round, round tapered and square tapered poles. If you need the round, square tapered or round tapered poles give us a call. 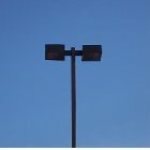 If you need area lighting poles, street lighting poles or just poles for mounting flood lights we can supply them for you. If you need to have your parking lot lighting job site designed we can do that for you. With a zero cost layout design, you cant lose by giving us a call. Need a 16 ft or 20 ft pole kit quick, Click on the first picture on the left side of the page. Our QUICKSHIP poles 16 and 20 ft are powder coated BRONZE over galvanized and ship in 1-2 days. Over 20 ft poles are powder coated steel with 2-4 week production time. Call us for color and different wattage options. The parking lot lighting kits comes complete with everything but the wire inside the pole and the concrete pier.